When I decided to renew the charm of the Arusuvai Friendship chain little did I know that it would become so popular. Within the first week itself we had several interested bloggers to the list and till date everyday I open my blog I see new entries. Right now we have 36bloggers from India and 4-5 interested bloggers from abroad, whom we plan to link in the chain at the last stage of Arusuvai. Bharathy and Srivalli both warned me of the difficult job of co-ordinating the whole system of linking up one blogger to another. And truly it’s a huge task of contacting the interested bloggers, collecting all the information, co-ordinating the chain and keeping track at each and every step. But all thanks to our wonderful participants whose co- operation made it all so easy. Above all I always know that Bharathy and Srivalli are there to help me out with everything. They always encourage me and share experience at each and every step. The chain was put to start by Bharathy of ‘Spicy Chilly’ in October. She sent Pumpkin seeds to me (Sayantani). 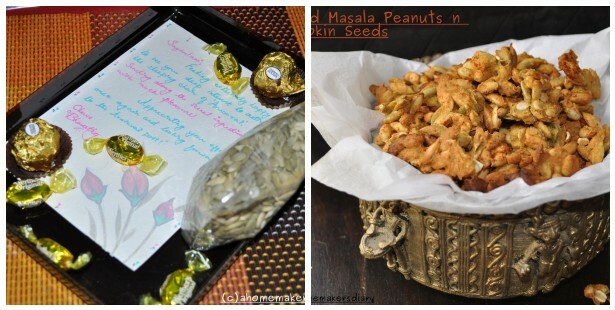 Check the Baked Masala Peanuts recipe that I cooked for my family. 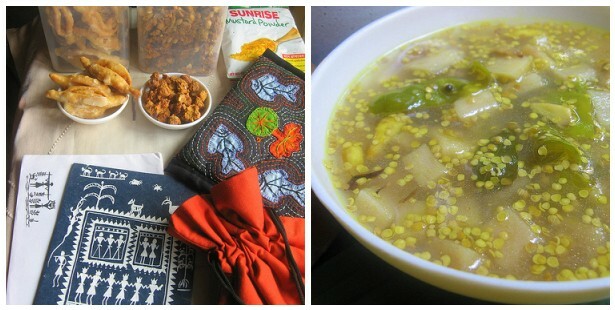 Sayantani of ‘A Homemaker’s Diary’ sent mustard powder to Bharathy with which she made a traditional Kerala style Banana stem pickle called Vazhapindi Achar. 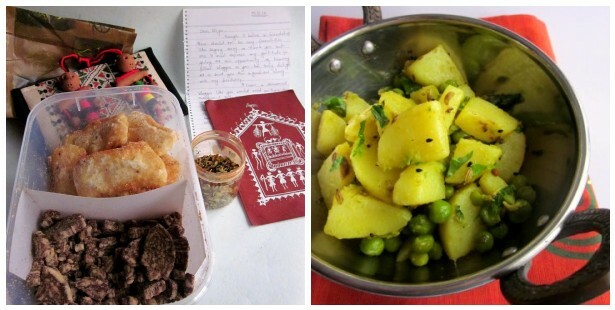 Divya Kudua of ‘Easy Cooking’ received Panchforon from Sayantani with which she cooked a Bengali style Potato and peas curry. 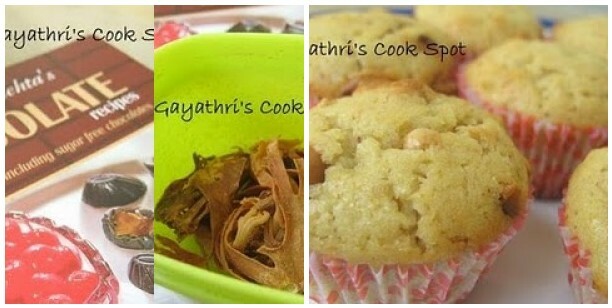 Gayathri of Gayathri's Cook spot received Mace or javitri from Divya and she baked a batch of Aromatic nutty Muffins. 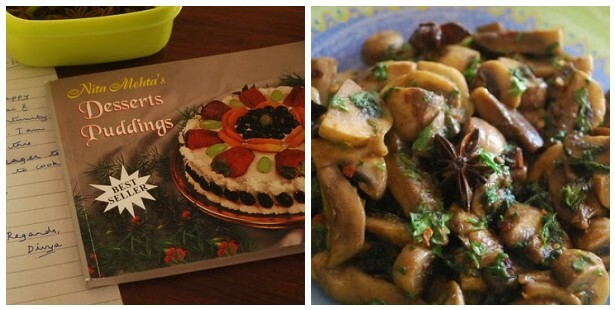 Megha Goyal of Live to Eat received Star Anise from Divya and she prepared Sauteed Mushroom. Shalini of Sanctified Spaces received yellow mustard seeds from Gayathri. 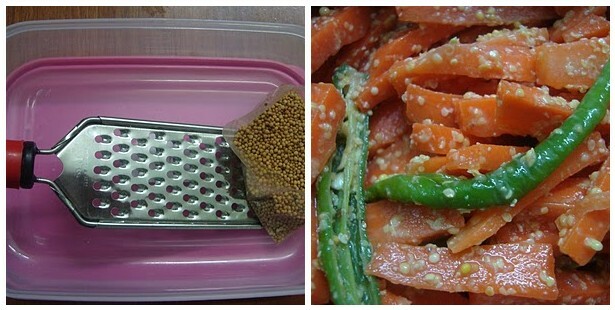 She prepared a tongue tickling Crunchy Carrot and Chili Pickle. Priya Hari of Priya's Kitchen received Black sesame seeds from Hema. 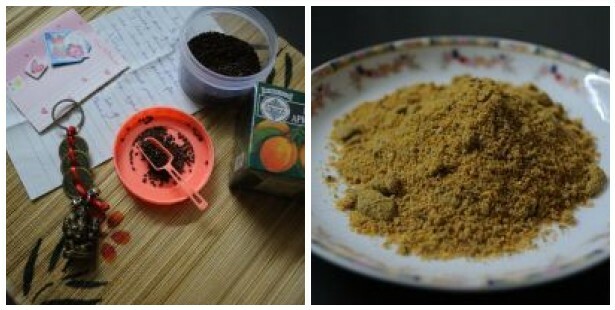 She prepared a spicy Milagai Podi to spice up breakfast. Nisa Homey of 'Cooking is Easy' received Palm jaggery fom Hema, with whcih she prepared a mouth watering delicacy called Kozhukattai. Veena Arvind of 'Kitchen Celebrations' received Kokum from Megha and she prepared a healthy and tasty Ayurveda inspired recipe from Sukham Ayu. A must check recipe of Gujarati Dal. 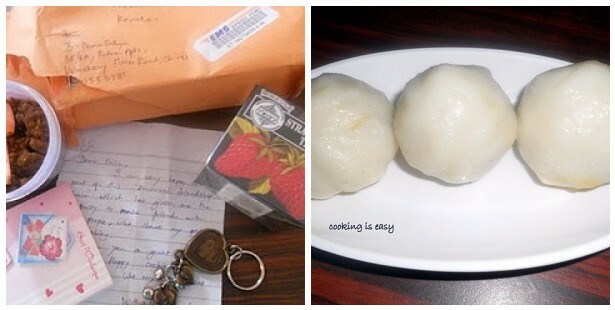 Kajal of 'Kajal Dreams' got a lovely Valentine themed package from Shalini. 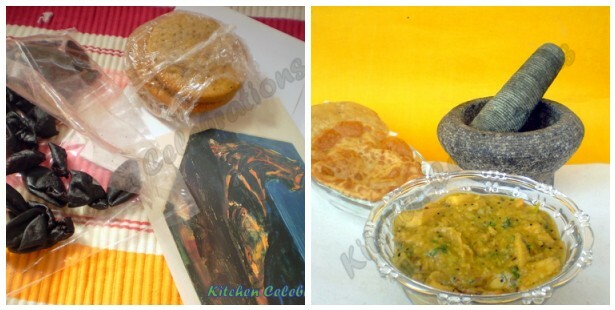 She got poppy seeds and made delicious Potato Curry and Poppy seeds Halwa. Keep on checking this page to know what Archana and Aparna are cooking next. 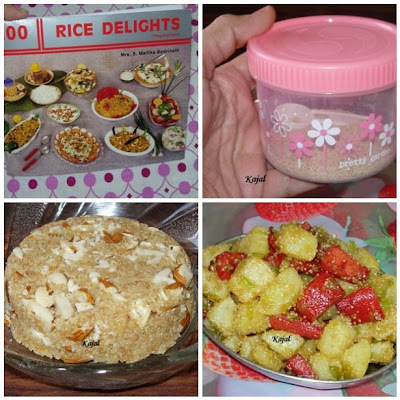 I will be updating this page as and when participants post their Arusuvai recipes. The link would be placed at the top of my home page. Oi Warli chhobi gulo ki, S? Khub shundor. Wonderful .You really work hard. Awesome roundup..Seems u guys are having loads of fun with the mystery ingredient.. Echoing (I think) what pree said--love the Warli--you did? the spicy pumpkin seeds look wonderful--have to book mark this recipe for next autumn. Such a lovely idea, the friendship chain. This is the kind of happiness that truly warm your heart. Good job. Good work Sayantani...waiting for my turn. thanks a ton buddies. it would not have been possible without your support. Thanks Bharathy, am glad that its running smoothly (touch wood). Hi dear, it is very interesting and i too like to join in this chain.I will in Uk.Its a very grt idea of making friends forever. Hi friend, I have heard about this lovely network from our very own friends Bharathi and Srivalli but just a few days back I happened to read more about it and I am interested to be a part of it too. :) It sounds like a lot of fun and no wonder it would be awesome when there is some suspense attached to it :) Hook me in if I am not too late to enter. Thanks Sayantani for posting my link..and for this wonderful network. Glad to have you on board Nithya. have mailed you all details. @Shalini, it was great interacting with a beautiful person like you. Sayantani check my page I posted a recipe for Arusuvai friendship chain. Hi. I would like to join the chain. My mail i.d. is chocolatesanddreams@gmail.com.